Together, friends can do almost anything. 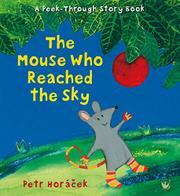 In this tale of teamwork, Little Mouse wants the beautiful red marble she sees in a tree, but she just can’t reach it. Determined, she enlists the help of Mole, who assumes it’s a shiny balloon, and Rabbit, who is sure it’s a big ball. Can they come up with an idea to get the object down and identify it once and for all? Perhaps if they work together….The minimal text is clear and straightforward, and the charming and evocative mixed-media illustrations are bright, distinctive, and appealing. One die-cut page allows readers to peek over Little Mouse’s shoulders into Mole’s hole, and then back out at Little Mouse silhouetted against the sky; a vertical gatefold further on emphasizes the animals’ towering teamwork. While some elements of the story are familiar—the animals’ climbing on each other's shoulders is reminiscent of My Friend Rabbit—themes of working together, making mistakes, and resilience blend nicely here. As the three climb atop each other and stretch as high as they can, it turns out they aren’t…quite…tall…enough. “Oh no! / Whoops! // CRASH!” Down they go. The good thing is that the shiny red thing (or things as it turns out) tumbles down too, so they will certainly be able to discover its secret.